There are a number of slots that are highly-anticipated for an online release having been so popular in the land-based casinos. 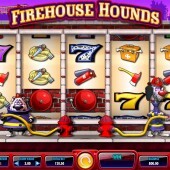 US-based developer IGT's latest slot to be listed in that category is Firehouse Hounds. 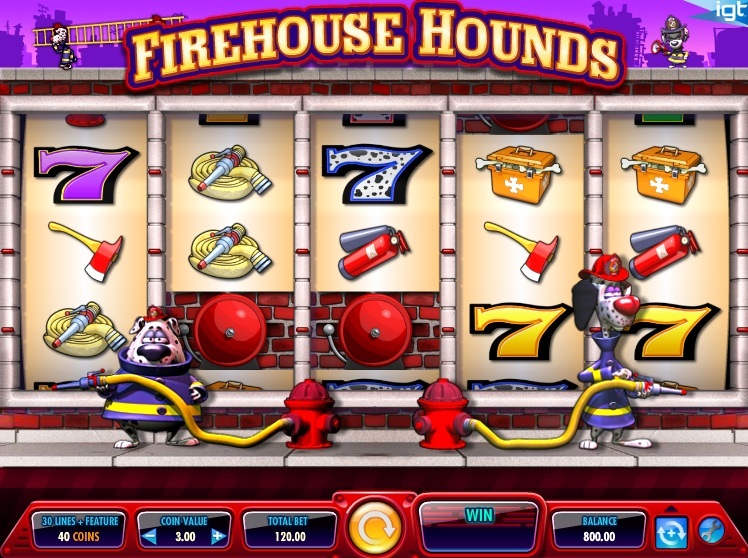 A quirky, doggy-themed slot where a crew of Dalmatians takes on the role of fire fighters. Not the most obvious of themes but for a developer that has released some of the most serious and romantic-themed slots it makes for a refreshing change. Firehouse Hounds is a 5 reel, 30 payline slot that has a comedic feel to it as you try to win some big wins with the Dalmatians attempting to help you with your efforts. You will certainly never watch 101 Dalmatians in the same way ever again. Luckily, there is also no Cruella de Vil on this slot! If you love your different symbols on the slots then you will not be disappointed here. There are a load of them including a fireman's hat, a fire hydrant, doggy tool kit, fir extinguisher, fire hose, fire axe, and a selection of different coloured number 7 symbols including a couple that are covered in Dalmatian spots. The Wild symbol is conveniently represented by the Wild icon. It substitutes for all other symbols, except for the Bonus symbols, to complete any possible winning combinations that might appear on the reels on a single spin. Speaking of the Wilds, there is a great little randomly triggered feature on this slot. The Wild Fire feature means that on any spin reels 1, reel 5, or both can turn completely Wild. This can create a lot of potential winning combinations. There are also free spins to be won in the Wild Fire Free Spins Bonus. You will need to hit three Bonus symbols, represented by the fire alarm icons, to trigger the free spins. Once triggered, you will need to select a fire pole to reveal between 4 and 6 free spins. Wins achieved during the free spins will be subjected to a 30x multiplier. Reels 1 and 5 are also completely Wild during the free spins. It is also possible to re-trigger the free spins if you hit three fire alarm Bonus symbols during a free spin. Firehouse Hounds was a big success on the land-based scene and it's fantastic to see it online now. The randomly triggered Wild Fire feature adds suspense on each spin and the free spins bonus round is one of the most riveting I've played in recent years. It really does put Microgaming's doggy-themed Hound Hotel to shame. Just sit back and enjoy IGT returning to form. This could arguably be IGT's best land-based to online conversion since the harbour-set Lucky Larry's Lobstermania slot.